The other day I had a doctor’s appointment. My custom is to take the morning paper with me to appointments since there is always some waiting time and this is a good way to spend it. The doctor saw me and said, “I didn’t know anyone read paper papers anymore.” So, how much news do we consume and is it healthy for us? Let’s start with paper because I think that’s the most tangible and easiest to tame. We get 2 daily national newspapers (New York Times & Wall Street Journal) and 2 biweekly religious newspapers (one national and one local). I admit that this is already too much to read. I read the front page, op-ed page, and perhaps another article or two in the NYT. Our daughter writes for the WSJ so I read anything she writes and compare headlines with the NYT. A Step Forward: The one newspaper strategy that I’m most proud of is our daily newspaper swap. Several years ago we decided to discontinue the local daily paper but we still wanted to know basic local news. Our neighbor agreed to bring us the daily local paper after they’ve read it and we give them the NYT. Everybody wins. We get 5 monthly magazines (2 of these I read pretty thoroughly – often in the bathtub). I skim 1. The others are primarily of interest to Jim. A Step Forward: We used to get more magazines but cancelled most since we were getting enough news through the newspapers and radio. After skimming the New Yorker (It’s too long to read everything and I’m still trying to figure out many of the cartoons) we give it to a librarian friend for her school. We used to get 15 catalogs (5 garden, 5 professional, and 5 clothing/household). Some were duplicates. A Step Forward: I used Catalog Choice to reduce our catalogs to 6 since I can get most of the info I need online. Catalog Choice was pretty easy to use but it didn’t list one of the seed catalogs so I had to email the company directly. I like LLBean and didn’t want to drop this catalog but I was getting more than one a season plus sales and Christmas. When I called them, I was pleased to find out that they will reduce your catalogs to your specifications. This includes preapproved credit offers, solicitations, campaign literature, and ways to save me money. A Step Forward: I can’t stop campaign literature (Heck, I’m often the one going door to door distributing it.) but here are several ways to reduce (not eliminate) the others. Direct Mail Association (DMAchoice) maintains a “do not mail” file of Mail Preference Service registrants. Members are required to remove the listed names from their rosters of prospective customers. I found it a bit overwhelming to try to choose among the many options so I ended up asking to be deleted from all the categories. I did this 3 months ago. (It sometimes takes up to 3 months to take effect.) So far I’m not aware of missing anything important. I haven’t noticed much reduction in my junk mail but then I didn’t get much anyway. No harm. Little gain. Opt-Out Prescreen (888) 567-8688 as the primary reference. I was about use this service but noticed that Opt-Out Prescreen asks for personal information including your home telephone number, Social Security number, and date of birth. Although the information is said to be confidential, I became suspicious. After checking several websites including Snopes, it seems to be legit. Still, I think I’ll put up with this mail. Identity theft is just too prevalent. As wonderful as books have been in my life, I don’t take the time to read many anymore. Mostly I’m an article reader. I get most of my books from the library. I’ve pruned many books from our bookshelves over the years. What’s left are mostly for reference and historical purposes. Read How Giving Away 1,000 Books Made Me Love Reading Again for inspiration. Please add your tips and experiences. I have reduced by solicitations by mail and phone to only 1 or 2 % of what it used to be. The secret was to shift from giving a small amount of money to lot of charities, to giving lots of money to just a few charities. Of course to do that one needs to be careful of the credibility and efficiency of the charity, which is why I offer a presentation about how to determine their rating. More recently I am nearly finished with a do-it-yourself method for rating the 99.5 % or charities that are not analyzed by the evaluation services. #2 | Written by Susan Vogt about 4 years ago. Ray, never fear. I plan to address the issue of being overwhelmed with bad news in the last (5th) post in this series. I welcome other’s ideas in preparation for that. #3 | Written by Debbie Frankenhoff about 4 years ago. #4 | Written by Ray Hassard about 4 years ago. This is a very interesting topic to me. In my case, I do not get a newspaper, do not have a TV, do not listen to the radio. I subscribe to art magazines, and find myself browsing them, then shelving them. Maybe I don’t need so many of them, but it is a professional expense. 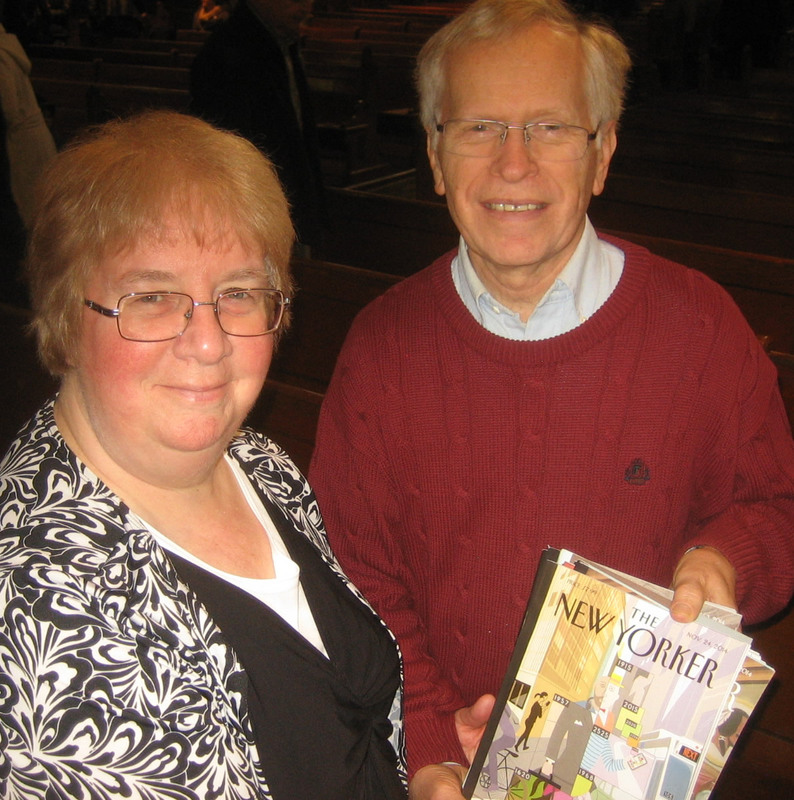 Together, Don and I subscribe to The Week, news magazine. Don gets some Christian mags, science and health newsletters and Natl Geo. I take big stacks for The Week(s) with me when I travel and it always surprises me how little is of interest 4 weeks or so after it happened. There is a mania to be “informed” about current events that might be media induced, but is, I think, largely a waste of time and energy. I have so little free time that I would rather spend it some other way. If it matters I find out about it; if not, I have not missed anything. Is that an ostrich attitude? And with so little free time, I will definitely not waste it on social media. One thing you mentioned yet didn’t address is the Bad News Overwhelm syndrome. I have one friend who regularly gets depressed to nearly suicidal depths by the world’s news, yet can not stop listening. News addiction is a serious thing for some. I also am very concerned about the fear mongering that comes with the news and is frightening many people into viewing our world as threatening and dangerous. So many believe what they read or above all, see on TV and the computer, without checking the facts. We went through a lot of explaining about the Affordable Care Act that was an attempt to counter the un-truths and mis-truths put out there. #1 | Pinged by Simple Living Works! eNews #49 | Simple Living Works! about 4 years ago. #2 | Pinged by Simple Living Works! eNews – DIY “Whose Birthday?” + Fall Resources + “Alternative” Ph.D. Dissertation | Simple Living Works! about 4 years ago. #3 | Pinged by Simple Living Works! Weekly – Submit to “Whose Birthday?” + Fall Resources | Simple Living Works! about 4 years ago. #4 | Pinged by Simple Living Works! Weekly–Steve Beumer, Champion of Change | Simple Living Works! about 4 years ago. #5 | Pinged by Simple Living Works! Weekly | Simple Living Works! about 4 years ago. #6 | Pinged by SLW! eNews! #47 – Earth Mama | Simple Living Works! about 4 years ago.